Established in 1982 to preserve the memories of Orlando’s vanishing landmarks and the contributions of Orlandoans, past and present. This second downtown band shell designed by architects Ida Ryan and Isabel Roberts was built in 1924 and served as an entertainment venue for snowbirds and locals throughout the winter months. Later, as politicians learned that it would be a great place to make promises to constituents, the bandshell became a popular place for political campaigning in the city. Originally completely open to the lake air, enclosures were built around the band shell to enhance the acoustics and megaphones were added later to project the sound and help block the sun. Ivy and other foliage grew around the ramp and platform. Shortly after this photo was taken, the green benches were painted red/orange which appear in many color photographs taken in the early 1950s. 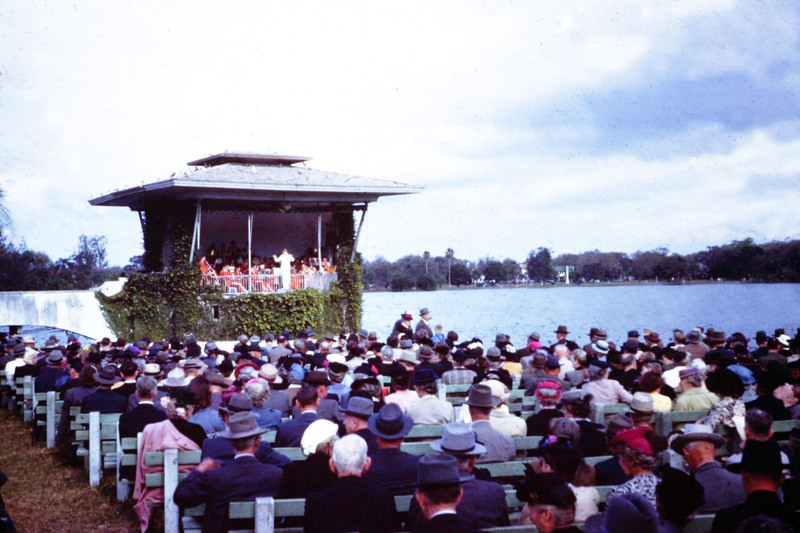 By the late 1950s, the bandshell fell into disrepair and became a favorite hangout for birds of all kinds; so much so that it was jokingly nicknamed “The Rookery” by locals. It was eventually condemned and demolished in 1957. In this 1946 concert, it appears that it may be band students performing from Orlando’s Memorial High School which was just across the street (Rosiland).